How would you like have your own public speaking coach? For the first time ever, International trainer and seminar master Bob Yates and Media Expert and Communication Skills Coach Annetta Wilson will pour themselves into a select group of individuals who want to earn a 6-figure income while transforming the lives of others. Prior to now we have never offered one on one training at this level to anyone. Our goal is to take a few individuals from the bottom to the top in the public speaking arena. NOTICE: Our team is ready and willing to coach you to Mega Speaking Success! The demand for our public speaking, media and marketing training is at an all time high. Do not consider this option unless you are SUPER SERIOUS about making dramatic improvements in your life, business and finances. FACT: The most effective way to increase your skills is through personal mentoring. Throughout history, the world’s most accomplished individuals were mentored by experts in their respective fields… experts that carried an indisputable track record of success. For more information about the Champion Speakers Academy contact: (301) 218-8200 or simply complete the form below and a team representative will contact you shortly. Are You Ready to Be a Part of An Exclusive Group of Speakers, Trainers, Authors and Infopreneurs Who Know How to Make Real Money While Adding Real Value to Others? Without question, being a speaker or trainer can be one of the most exhilarating and fulfilling professions on the planet. As with any business, it takes the RIGHT KNOWLEDGE and a certain level of SKILL to achieve extraordinary success; which is why many speakers and trainers are not experiencing the success they deserve. I have personally spent more than two decades learning the speaking business. 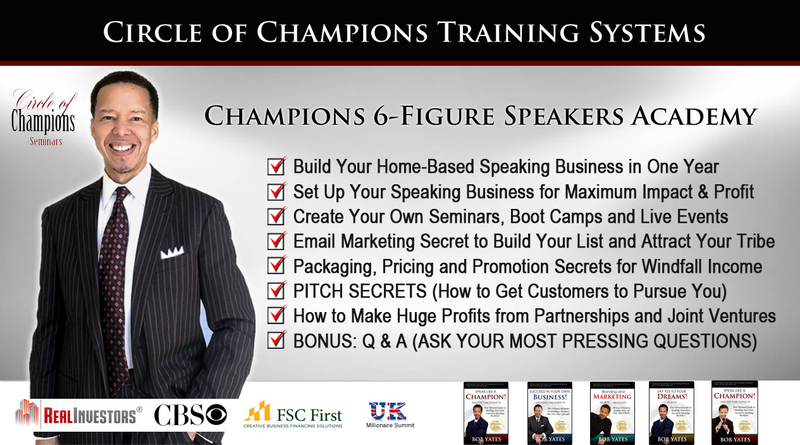 Through the Champion Speakers Academy I am ready to share my best kept secrets to speaking success with you. As a member you will have unlimited access to all Circle of Champions live events, teleclasses, webinars, workshops and private trainings. 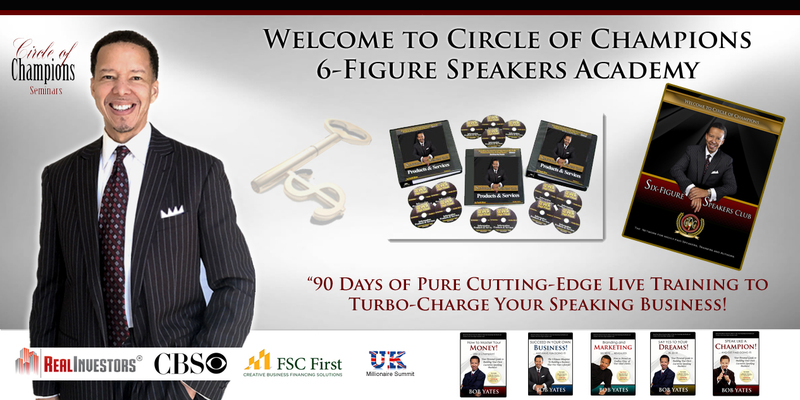 Below are just a few programs that will accelerate your success. Odds are you’re reading this because you desire to touch lives and earn a lucrative income through speaking. You are not here by chance. The Champion Speakers Academy is the ultimate training ground for speakers, trainers and seminar leaders. With decades of experience and expertise in seminar leadership in your corner, your success is virtually guaranteed! It’s obvious that the fastest route to your success is working with someone who’s already achieved the results you are working towards. Being mentored or coached by someone who’s “been there, done that” can eliminate years off your learning curve in a matter of minutes. In the early 90’s I made it my business to align myself with some of the most accomplished speakers, trainers and thought leaders on the planet. I have personally worked with and have remained connected to the best in the business. My mission in the Champion Speakers Academy is to pour what I have learned over the last two decades into a select group of hungry individuals who are ready to increase their influence, impact and income through the awesome power of public speaking. These speakers, trainers, authors and entrepreneurs are making difference. Join the ranks of speakers, trainers, authors, coaches, consultants and infopreneurs that are making impact around the world! We will provide you with coaching and support to become an outstanding speaker or trainer! We will connect you with key people that will help you to grow your speaking business! You will learn how to earn a six-figure income while teaching what you love! You will have the opportunity to speak at our COC and WIBNA seminars and events!